Why Should You Choose MARSQUEST Polarized Sunglasses? YOU WANT ATTENTION? JUST WEAR MARSQUEST SUNGLASSES! Most classic style sunglasses for men and women, never out of fashion. Golden ratio, especially designed for American's face shape. Everybody needs one! UNBELIEVABLE! DOESN'T EVEN LEFT A SCRATCH AFTER CRUSHING BY A CAR! The Most Durable Sunglasses Ever! Made by EMT scientific material. Tested by 100lbs pressure and car crushing! Still works fine and won't even leave a scratch! CAN'T FEEL ANYTHING AFTER WEARING A WHOLE DAY! Only got 18g (0.635oz). The Most Lightweight Sunglasses on the World! Block the sun ray at ease, enhances any outdoor activity. Just like got polarized eyes! BRING YOU THE BEST VIEW SIGHT WITHOUT DIZZY! 100% UV400 polarized protection coating, blocks 100% harmful UVA & UVB Rays. Only restore true color. Wearing it all day without dizzy. With every pair of MarsQuest sunglasses sold, $1 is donated to the SickKids hospital to support SickKids' commitment to providing excellent care and support for patients and their families. We are so confident that our glasses are manufactured under strict quality standards to give our customers the best experience. For any problems, you can just contact us and we will reply you immediately to solve all of your worry In addition. Totally no risk of you! 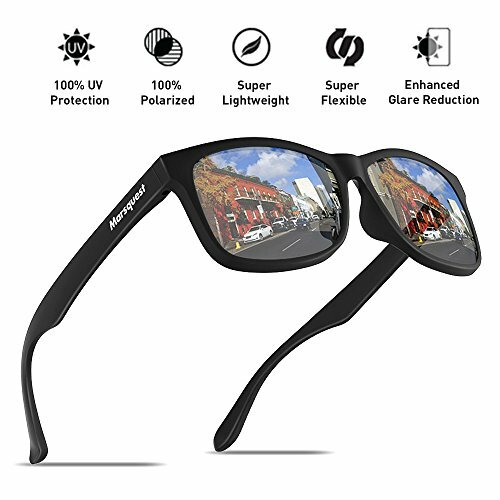 100% UV400 POLARIZED LENS SUNGLASSES - 100% UV400 protection coating, blocks harmful UVA & UVB Rays. Restore true color, eliminate reflected light and scattered light. Lens of this sunglasses for men and women includes 7 layers. The 1st layer is polarization layer. The 2nd and 3rd are bonding layers to enable durability. The 4th and 5th are UV protection layers to absorb UV light. The 6th and 7th layers are shatterproof layers. Protect your eyes perfectly and bring you the best comforts! SUPER LIGHTWEIGHT EMT MEMORY FRAMES - Only weighs 18g (0.635oz), Extremely comfortable even for long time wearing! The unique EMT material was produced through Swiss technology as a thermoplastic material that is incredibly durable, flexible, and lightweight. Since they are flexible, they can bend under pressure and contour your face comfortably. Ideal for outdoor activities like motorcycle or others. If you're guilty of constantly dropping your glasses, fear not! EMT frames can prevail! SUPER DURABLE FRAME! 100LBS PRESSURE TESTED - Can't be broken glasses! All EMT material made, integrated design, 100lbs pressure tested! High flexibility EMT frames are anti-collision, scratch-resistant and durable. Can't even get a scratch by car crushing. Also this flexibility also makes Marsquest glasses resilient to damage. Because the material is pliable, they are far less likely to break or bend from impact. PERFECT PRODUCTS DIMENSION! - Lens height: 44 mm (1.73 inches); lens width:55mm (2.16 inches); leg length:140mm(5.51 inches); nose bridge:10-32 mm (0.39-1.25inches); frame length: 138mm (5.43 inches). Perfect size and round shape, adaptable to all faces. The best match to your fashion style! 1 YEAR WARRANTY - We are so confident that our Marsquest polirized sunglasses are manufactured under strict quality standards to give our customers best experience. For any problems, you can contact us and we will reply you immediately to solve all of your worry. Totally no risk of you! Just add to your cart now! If you have any questions about this product by MARSQUEST, contact us by completing and submitting the form below. If you are looking for a specif part number, please include it with your message.